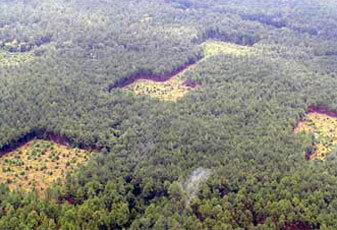 Corridors are habitats that are typically long relative to their width, and they connect fragmented patches of habitat. They can vary greatly in size, shape, and composition. The main goal of corridors is to facilitate movement of individuals, through both dispersal and migration, so that gene flow and diversity are maintained between local populations. By linking populations throughout the landscape, there is a lower chance for extinction and greater support for species richness. Corridors work by increasing connectivity between patches that are isolated by human habitat fragmentation, caused primarily by urbanization, agriculture, and forestry. 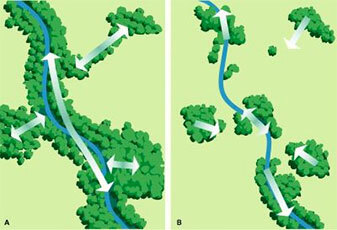 Plants and animals can use corridors for both dispersal and migration, two key movement patterns for species persistence. The human-dominated habitats surrounding more natural areas present barriers that plants and animals are unable or highly reluctant to move through. These inhospitable places may have higher abundances of predators, lower resource availability, or reduced shelter. When a corridor is present, however, it provides an unbroken path of suitable habitat that can provide safe passage for animals or plants without being hindered as they travel through agricultural or urban landscapes. This connectivity is key to population persistence, as it promotes gene flow between populations and supports higher species diversity. What types of corridors are there? There are many kinds of corridors, and the differences are often due to the purpose of the corridor. Corridors can exist naturally, such as riparian corridors that link two different populations dependent on isolated wetlands, and they can be constructed through management practices, such as preservation of multiple land parcels to create a wildlife corridor for large mammals. 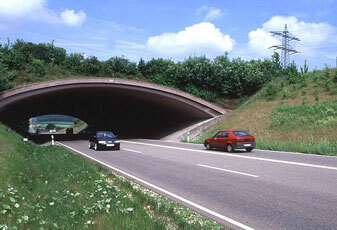 Corridors can be artificially constructed, such as overpasses or underpasses on highways, for the sole purpose of funneling individuals away from anthropogenic threat. Stream corridors can consist of a network of protected watersheds that allow fish to disperse or migrate long distance without being hindered by a road blockage or dam. Corridors can be large, as is typical in wildlands that follow mountain chains, or small, as is typical of greenways or wildlife overpasses in urban landscapes. The many different types of corridors all focus on the same goal: to ensure connectivity between isolated habitat patches so that one or many species can move freely throughout the landscape. What are corridors vs. connectivity? Landscape connectivity refers to the ability of plants or animals to move through a landscape. More connectivity means fewer barriers to dispersal or migration. Corridors are the clearest way to increase connectivity, as they provide structural connections between habitats in the landscape. But, there are other ways to increase connectivity where strict conservation is not possible. It may be possible to reduce the distance between conservation areas, or to manage lands in ways that are less harsh for wildlife. Plant and animal dispersal and migration are not always incompatible with human uses of the landscape. Conservation goals often include both benefits to humans and supporting biodiversity. What are some examples of corridors? There are numerous examples of corridors in dozens of countries across six continents. We’ve highlighted just a few of these examples in our sections on Experimental Corridors, Man-made Corridors, Natural Corridors, and Large-scale Corridors. Where can I find out more information about corridors? For a list of over 300 scientific publications covering 30 years of corridor science, management, and climate change, check out our Library. For access to tools that focus on delineating, designing, and implementing corridors in the landscape, visit our Corridor Toolbox. Keep up with recent scientific discoveries and the latest ideas for managing corridors in our Digest series of posts. Follow us on Twitter and Facebook for links to daily news and updates. I am a student interested in corridors. Where can I find information? For resources on publications, examples of corridors, tools for delineating corridors, and more, visit our Student Resources page. I am a manager interested in corridors. Where can I find information? For tools that can be used to delineate, design, implement, and evaluate the effectiveness of corridors and connectivity, visit our Corridor Toolbox. For examples of other corridors being implemented and managed, see our sections on Experimental Corridors, Man-made Corridors, Natural Corridors, and Large-scale Corridors.